This photodigital Image Capture of notes on alphabet declination for AB Blue Bird EMJ top of the sixth page. Here we can see the changes to letters. Writing them and writing them. Getting tired of taking so long there would lose strokes or have strokes blended. 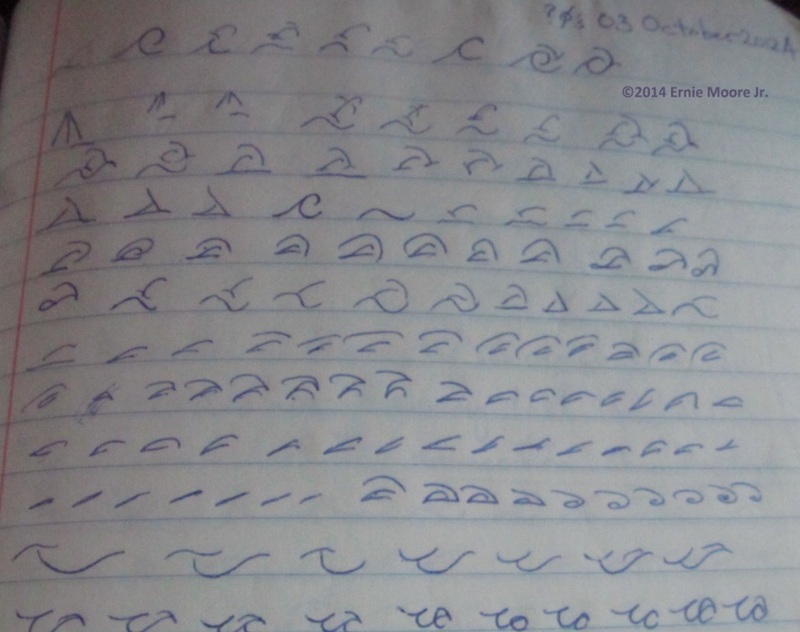 Writing fast can mean less to write or more compact shapes. Sharp is a quick whip gesture.-Ernie Moore Jr.
First letter is a horse ear. I decide the eye helps define the triangle as an ear. That’s pretty solid to me so I go on to “B” icon or second letter. Dolphin shape resembles ocean wave. Wave becomes dolphin out of the water. Now set the style of the water. For this letter/icon this is what I think would change with use. Curve loses the waves and straightens. Even the dolphin can lose its curve for the more direct shorter stroke. And we generations later do not see the shapes as more than marks with no meaning except assigned valued.-Ernie Moore Jr.
For me one style of making an alphabet is grouping similar icons for sections of alphabet. I’m comfortably set on “B” and “C” from one dolphin leaping to a dolphin leaping over the leaping dolphin. And working on my solid for the design of a dolphin diving to get “D.”-Ernie Moore Jr.